The proposed measures include cooking bans, restrictions on family and lawyer visits, reduction of water supply to prisoners and confining prisoners from opposing Palestinian factions in the same facility. Israel last week unveiled a plan to severely restrict facilities for Palestinian prisoners. The plan was announced by Israel’s public security minister, Gilad Erdan. The steps include cooking bans, restrictions on family and lawyer visits and reduction of water supply to prisoners. The plan includes new rules wherein security prisoners from opposing Palestinian factions will be held in prison together, as opposed to earlier, when they were confined according to their affiliation. Prisoners belonging to the Palestinian Fatah party told the Israeli daily Haaretz through an intermediary that this plan was a propaganda tool for the minister to increase his popularity within the Israeli ultra right-wing Likud party, noting that this plan would end up badly hurting them. Under the proposed new rules, prisoners will also not be permitted to cook inside their cells. Furthermore, cooking utensils and appliances will be confiscated, and the “canteen money” that prisoners received from human rights organizations and family members will also be curtailed. Showers will be removed from prisoners’ wings and access to them will be drastically reduced, along with access to televisions. The new rules would also ban Israeli members of parliament from visiting the Palestinian prisoners. The plan will become operational after it is approved by the Israeli cabinet, which could take a few weeks. These new rules are the recommendations of a special committee set up by Erdan in June to make prison conditions more tough and extreme. Reacting strongly to the plan, Mustafa Barghouti, head of the Palestinian National Initiative party, told Al Jazeera that the Israeli government felt it had a free hand to oppress Palestinians any way they want, and that the only way to stop this inhuman, reprehensible behavior was for the international community to introduce sanctions against Israel. 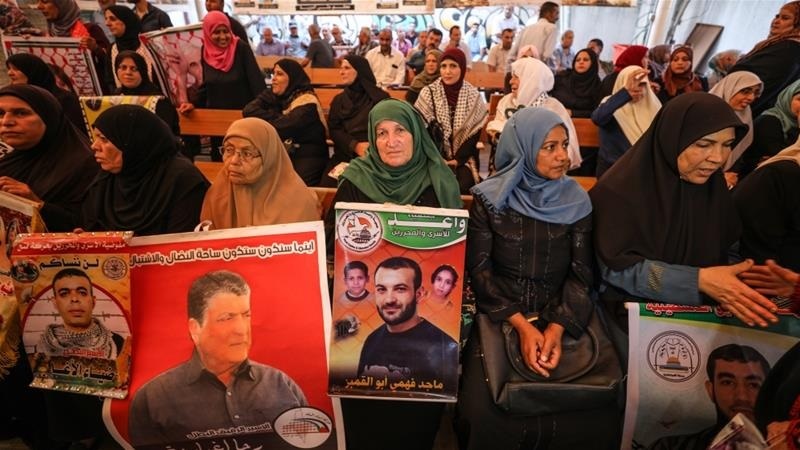 The Palestinian prisoners’ commission denounced the plan and said that it would have severe, adverse repercussions on the lives of the prisoners. Qadri Abubaker, the head of the commission, urged the Palestinians to take a common, united, national stand against the plan. Official statistics reveal that 5,500 Palestinians are in Israeli prisons, including 230 women and 54 children. According to human rights groups, 1,800 of them are in dire need of medical care, out of whom 700 are suffering from serious or chronic illnesses. In September last year, Erdan imposed another harsh measure by installing surveillance cameras in HaSharon prison. The cameras were supposed to cover the prison yard, the collective kitchen, washing machine areas and prayer areas. Since the day this measure was introduced, female Palestinian inmates have been protesting against it by refusing to go out for recreation or enter the areas that are under surveillance. The prison administration also confiscated the prisoners’ books and reduced the amount of water they could use. Female prisoners were not allowed family visits, hot water supply and Arabic television channels. They were excessively body searched and the amount of meat and vegetables in their daily quota was reduced. Male prisoners held in the Hadarim prison also showed their support and solidarity towards the female prisoners by refusing to go out to their prison yard. Two of them went on a hunger strike in October, refusing any medical and clinic visits.